You updated your shower with a new glass shower door, but there’s just one problem. Now all you can focus on when you look at your shower is the dated showerhead fixture. Not only is it an eyesore, its days of use have left it far less functional than you remember. Don’t just muddle through! Replace that showerhead to complement the rest of your bathroom renovations. Our favorite showerhead for function is the handheld wand style. These fixtures often come with a traditional wall mount connected to a hose and allow you to hold the showerhead so that you can position the spray. Wand showerheads are most useful when cleaning your shower or washing a smaller child as you can control where the water goes when rinsing hair. Does your bathroom have lower ceilings? 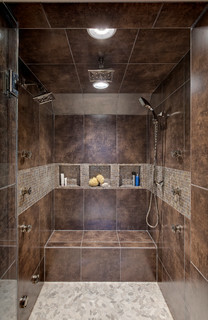 Rainfall or rain shower fixtures are perfect for these bathrooms because you can recess the fixture, thus maximizing the space in your shower. No more battling wall-mounted showerheads that are placed too low! Your tall family members will thank you. For the spa experience, here is a system of showerheads that can be adjusted. These spa showers offer a luxurious experience where panels of fixtures on opposite walls combine for a relaxing massage. If you’re considering upgrading your showerhead, you may want a professional to check your plumbing. They will be able to make sure your system can handle the extra heads of a multi-head system without sacrificing water pressure or using too much water. Need help with a shower door or other glass project? Janssen Glass is Kansas City’s go-to company for all of your glass needs. Contact us today to find out more, and make sure to keep up with Janssen’s blog for more helpful tips and tricks on keeping your shower in tiptop shape.